← Nothing says fall like apple dumplings. Crispy, crunchy chicken strips - the stuff legends are made of. Okay, kids. Here’s another recipe adapted from the America’s Test Kitchen recipe collection. This fried chicken comes out crunchy and juicy every time, and it takes very little work to make it all happen. You can make this with chicken pieces on the bone, but I prefer to make boneless chicken strips. It makes them easier to dunk in gravy, and we all know everything tastes better when dunked in gravy, right? Marinating the chicken strips in buttermilk makes them juicy on the inside, and the “shaggy crumbs” method of breading makes them crunchy on the outside. My version uses only 3 boneless, skinless chicken breasts but don’t let that fool you. This recipe made 18 chicken strips. Trim the chicken breasts to remove all fat. Slice each breast lengthwise into 1/2″ thick strips. In a medium bowl with a tight-fitting lid, pour in the entire bottle of buttermilk, the season salt and the cayenne pepper. Whisk to combine, and then add the chicken strips, seal the lid, give it a good shake and place in the refrigerator to marinate for one hour. 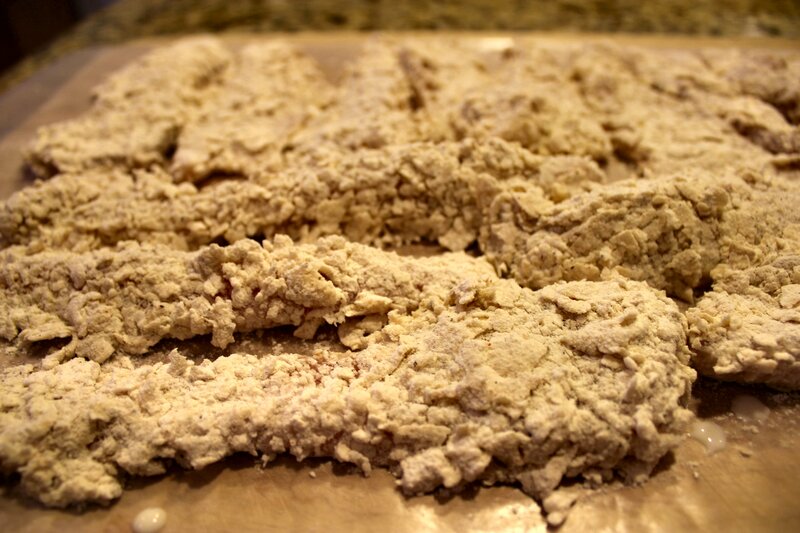 The shaggy crumb method is the key to crunchy chicken strips. Those beautiful shaggy crumbs are going to turn into crispy fried perfection. Using a deep, heavy bottom pot, add 1 ½” of canola oil and heat to 350F. To test if your oil is hot enough, you can drop one of your larger shaggy crumbs in. It should immediately start to bubble in the hot oil. If it doesn’t, wait for it to get hotter or you’ll get soggy, greasy chicken. Once the oil is hot, cook chicken strips 3-4 at a time and cover loosely with a lid. Cook until golden brown on each side. Don’t play with them too often. You don’t want to destroy that crumb coating. Just given them a gentle turn every once in a while. Remove to paper towels to drain, and move on to the next batch. Remember, because you’re using boneless breasts and the strips are fairly thin, these will cook pretty quickly. When they’re done, you’ll have a platter of crunchy golden perfection. 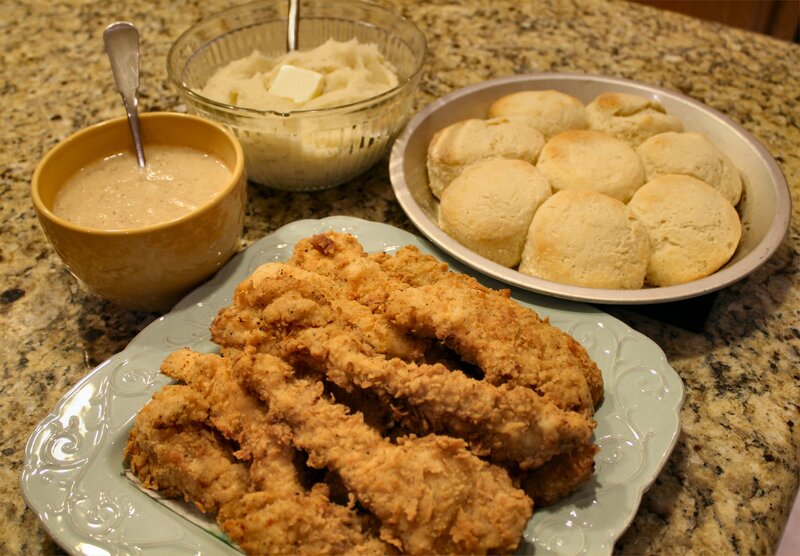 I like to serve this up with mashed potatoes (I stir in a little sour cream and a lot of real butter), my easy cheater buttermilk biscuits (I’ll share that recipe later), and some chicken gravy (made with chicken broth instead of milk). Throw in a bottle of Savannah Bee Black Sage honey, and you’ll be in hog heaven. This is southern fried comfort food at its very best. Now grab a fork and a bib and let’s dig in. Put on your fat pants - it's time to eat! Seriously, that is my kind of (easy) recipe. I probably couldn’t screw it up, but with me you never know! When you decide to drive to Houston for a chicken dinner, you can tell me when you’ll be here and I’ll have it ready! That’s a heck of a drive for a plate of chicken, even really good chicken! It would be much cheaper to try it yourself. It’s a pretty forgiving process, so take a deep breath, grab a cold drink, and go for it! I believe in you, Kandi. Done! Just remind me if I forget. That happens sometimes. I blame the menopause. Amen! Food always tastes better when someone else does all the work. Thanks for the thumbs up on the recipe. I’m glad your family enjoyed it. And thanks for visiting the blog and leaving a comment, as well. I really appreciate the feedback. Drop in again any time. You’re always welcome! Oh heavenly grail of griddle cakes! I LOVE America’s Test Kitchen. My sister is getting me the cookbook for my birthday! I love chicken strips too (my fav is Whataburger – not kidding). I have to try this recipe! Thanks for posting! I’m not able to get on your site everyday but when I do, it’s like unwrapping a gift. Just like TPW’s! BTW, how about that custom-painted mixer she’s giving away?!! Oh…I so want it…but in blue. Sigh…. TCP and I are big fans of the Whataburger chicken strips, too. So are My Baby and Jonah Bear. It’s a family thing. I just happen to be making these chicken strips for dinner tonight with a batch of peppery cream gravy, mashed potatoes and my Kopy Cat version of KFC coleslaw. Mmmmm….can’t wait. Thanks for the comment that reading my blog is like unwrapping a gift. I love that! And what a gift that custom painted mixer would have been. I thought it was beautiful. A little over the top, but beautiful! I’m hoping you can direct me to the location on your blog where I can find the recipe for “cheater buttermilk biscuits.” Would love to make this whole meal just like you do including the coleslaw and biscuits. Thanks! Thanks for the reminder, Jill! I realized when I read your comment that I never posted the biscuits. 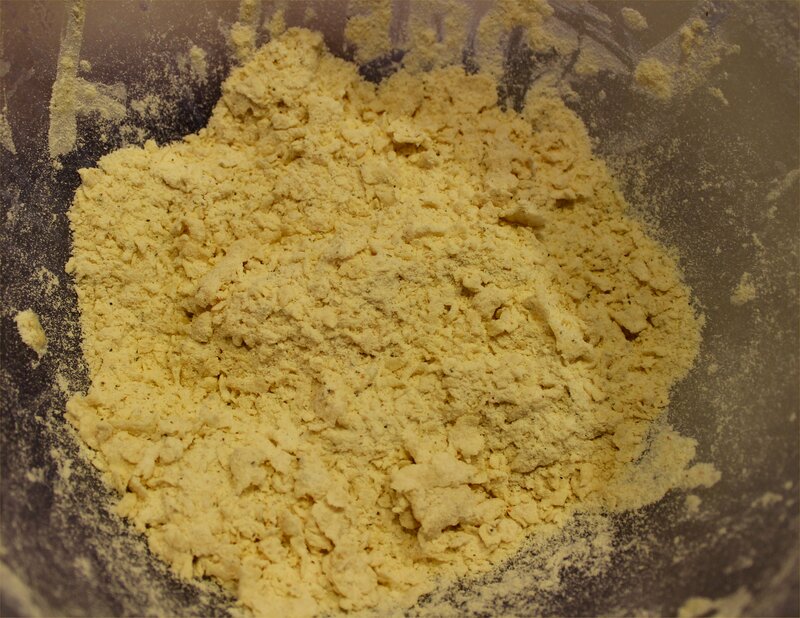 I call them “cheater biscuits” because I start with a baking mix – Pioneer Buttermilk Baking Mix (similar to Bisquick, but better). I use the biscuit recipe on the box but instead of adding milk, I add lowfat buttermilk (makes them much fluffier) and I also stir in a few tablespoons of melted butter. Mix up the dough just until combined (don’t over-mix biscuits) and pat it into a rectangle about 1″ thick on a lightly floured board; cut into circles and place them in a lightly greased baking pan so that they are barely touching each other. Put a pat of salted butter on top of each biscuit and bake at 450F for 12-15 until they are a light golden brown. Allow them to cool for a few minutes in the pan before serving. These are so good no one will suspect you started with a mix. And as a bonus, they come together in just a few minutes. When I make that fried chicken meal, I mix the biscuits up first and set the pan aside until about 20 minutes before dinner is ready. Then I pop them in the oven while I’m finishing everything else. That gets them on the table hot out of the oven, just in time. As a bonus, they keep well in the fridge and make excellent breakfast sandwiches with your favorite sausage or ham and a soft fried egg. Or you can eat them my favorite way – with real butter and Savannah Bee Black Sage honey. Have mercy. It’s delicious! Mashed Potato Tip – I use thin-skinned white potatoes when I make mashed potatoes. Boil potatoes over medium heat until fork tender, then drain off the water and leave them in the warm pan. I leave the skins on, but if you want you can peel them and drop them back into the pan. I use an old-school potato masher and mash in 3-4 tablespoons of salted butter, 1/2 cup of sour cream and just enough milk to get them to the texture I want. Season them with kosher salt and freshly ground black pepper to taste. The potato masher keeps them from turning into wallpaper paste, and the sour cream gives them a really wonderful zing as well as a nice creamy texture. Enjoy! Thank you, thank you, thank you! DH will be home Sat. night and he is in for the best surprise for dinner on Sunday. This sounds so good to me and I know he’ll love it even more. Thanks for responding to my question. I can’t tell you how much I enjoy reading your blog. Hope you keep sharing your recipes, tips, life stories, great humor, and more for a long time to come. I can’t wait to give this a try once I’m home from this round of travels. 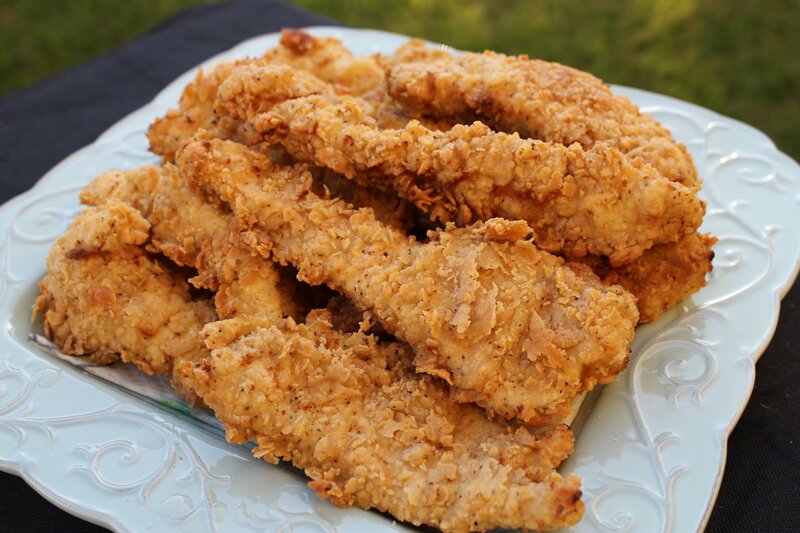 I love fried chicken and this recipe looks delicious! I just tried this recipe for the first time but used regular milk (have no buttermilk in house) and my family loves it. My husband would prefer this over my mother’s recipe, which is pretty awesome. It did not take much time either. I know it was posted awhile ago, but thanks for sharing this recipe. I attempted to make these today. They came out pretty good but on some the skin/crunchy coat would come off when I took them out of the oil. What was I doing wrong? 3. Make sure your oil is the right temperature before you start frying (350F).